When you choose Sixt car hire deals in Chile you know your business or holiday driving is going to be stress-free. Select from our premium fleet of vehicles at affordable rates and enjoy our excellent customer service. We have a wide choice of vehicles designed to suit every budget from economical cars to something more luxurious and special. We have put together some useful driving and travel tips to help you when you rent a car in Chile. With five car hire in Chile branches located at airports and in major cities we are ideally placed to ensure a relaxed arrival at your destination. 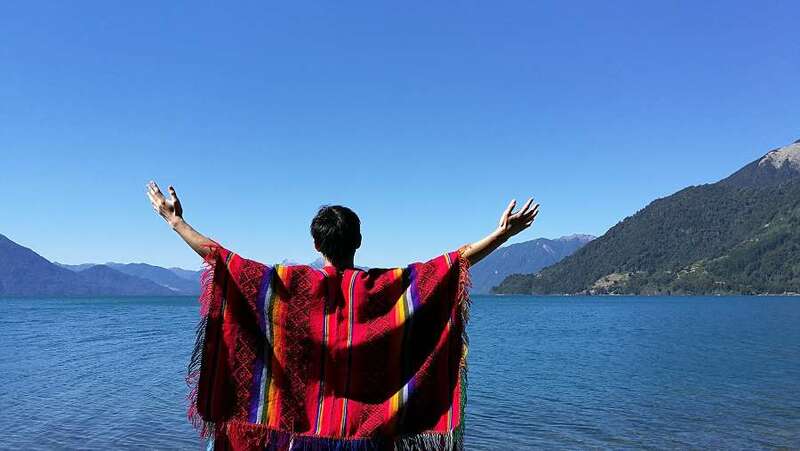 Our car hire in Chile booking systems are straightforward and should your plans change, cancellations are often free of charge. Take a look at the map above to see some of the cities and sights we recommend visiting with your car rental in Chile. Your Sixt car hire in Chile is provided by well-known names like Mercedes-Benz, Jaguar, BMW or Audi. Click through to our bookings page to rent a car in Chile with automatic transmission as well as organising one-way rentals and selecting optional extras such as child seats. Which car rental in Chile is right for me? Navigate city streets in compact vehicles. Enjoy longer journeys and weekend breaks in comfortable saloons. 4x4s and estate cars are spacious enough for five people and their luggage. Cruise beautiful coastlines in luxurious sports cars and convertibles. Chile accepts all international and EU driving licences. If printed in non-Roman scripts such as Cyrillic, Arabic or Russian licences must be accompanied by an International Driver's Permit (IDP). Obtain this online in the UK or from Post Offices. The minimum age for driving a Sixt car hire in Chile is 21. Surcharges may apply for drivers under 25. Full details are available in the booking engine. You can pay for car hire deals in Chile with all major credit cards. Prepaid or debit cards such as VISA Electron, however, are not accepted. The credit card must be in the driver's name and be presented along with photo ID at vehicle collection. Should you encounter any problems in Chile contact our hotline on +56-225136000. In the event of an accident contact the police on 133 or the ambulance service on 131. Motorways in Chile are well-maintained but surfaces on other roads can be variable. Spanish is used for road signs along with an eclectic mix of colours and symbols so it is worth spending a few minutes familiarising yourself with important road instructions. Chilean drivers usually follow the rules of the road making driving here more relaxing than in some other Latin American countries. Santiago de Chile has rolling restrictions based on number plates in place in an effort to reduce congestion and pollution. Drive on the right in Chile. Kilometres are used for distances and speed limits. Toll roads are common in Chile. Apart from Santiago which uses an electronic toll system, other tolls require payment in the local currency. In Chile it is illegal to use mobile phones, wear earphones or smoke while driving. Children under 12 must travel in the rear of vehicles and we recommend the use of appropriate child seats. Major cities operate a pay and display car parking system along with concessionary street parking. Here you pay a set fee in pesos and obtain a receipt to display on your windscreen. You will be responsible for any repair costs incurred by driving your rental vehicle off paved surfaces. In an attempt to combat corruption police in Chile are no longer able to issue on-the-spot fines. Offering money to police officers is taken extremely seriously. Dedicated to the Roman god of the sea the Fountain of Neptune is a major landmark on the Santa Lucia hill in Santiago de Chile. 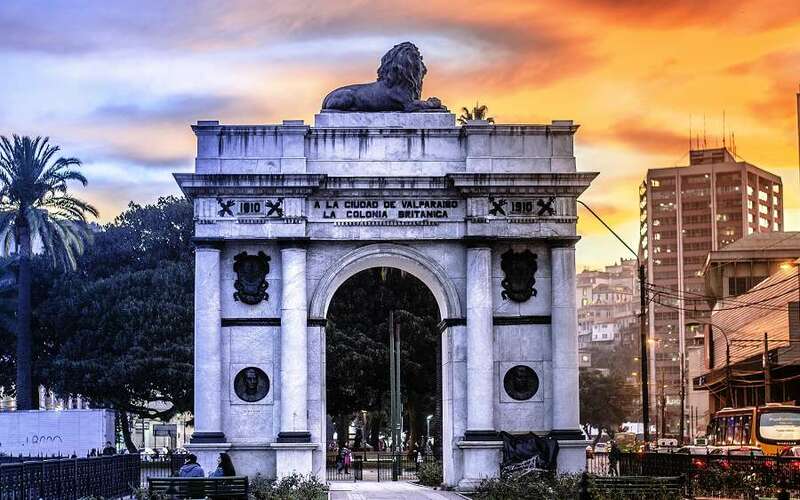 Set in beautiful gardens this monumental arch was built to celebrate Chile's independence. With its woodwork, wrought iron, tiles and turrets the Palacio Baburizza in Valparaiso is an ornate Italianate chalet in the Art Nouveau style. Today it houses a museum. 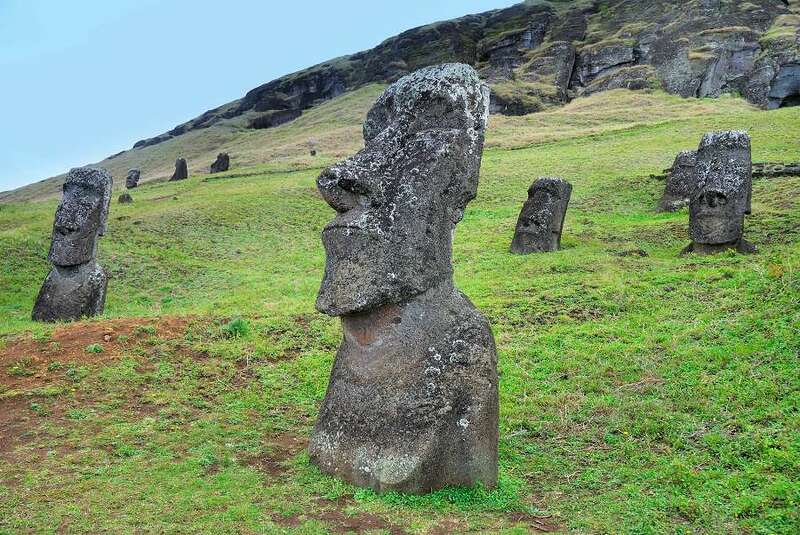 Ahu Tongariki is the largest Ahu or carving on Easter Island. Like all of the statues on the island, it faces sunset during the Summer Solstice. The Iglesias de Chiloe is typical of Chilota architecture. It is made entirely from native timber and covered in wood shingles. This type of architecture is able to resist the humid climate of the Chiloe Archipelago. Three granite towers are a major feature of the Torres del Paine National Park in Patagonia. Here you will find a landscape that varies from soaring peaks through blue glaciers and icebergs to golden grasslands. Los Flamencos National Reserve covers everything from volcanic landscapes to salt flats and desert wildernesses. It is home to Andean foxes and a wide variety of birds. The Villarrica is one of Chile's most active volcanoes but when safe it attracts tourism in the form of hiking, skiing and helicopter flights. The Radal Siete National Park is in the foothills of the Andes. Its most popular attraction is the Siete Tazas or Seven Cups, a series of waterfalls and pools. The Motorcycle Diaries (2004) is a biopic about the life of Che Guevara. Calama in the Atacama Desert and Valparaiso were just two of the locations used in Chile. The 2015 horror thriller Knock Knock starring Keanu Reeves was set in America but filmed in Santiago de Chile. The Quantum of Solace (2008), the 22nd James Bond film made use of the Observatorio Paranal in the Atacama Desert while Rapa Nui (1994) was based on the legends of Easter Island and filmed on the island. Taking your rental car across borders is not allowed. Doing so will invalidate your insurance.